Post graph or it didn't happen!!!!!!!!!!!!!!!!!!!!!!!!!!!! What was your tq at 399 and what is your steep? I know your running twins but what injectors? I have to be nice to the wife so she will take a pic and then upload the sheet so I can post it. My scanner isn't compatible with my new Windows 7 computer. I haven't even taken the time to look at the sheets close yet. You need more injector. Did it break 1000 ft lb of tq? More injector? I can black out a road anytime, just by stepping on it, unless my R's are way up, then it puffs a gob and I'm gone. Load dyno's can be stingy, so don't feel too bad. How is your afc set up? What were the "norms" of the day for the other trucks? Meaning... what were some cr putting down with certain mods... other 12 valves? Any vp trucks with twins? The star wheel was bottomed, but I turned it up twice last week to try to get it to come on a little later. I'm not sure how far I can go before coil bind, and haven't thought about how to figure it out yet either. I have some fuel in the cone area, so I need to change that o-ring. 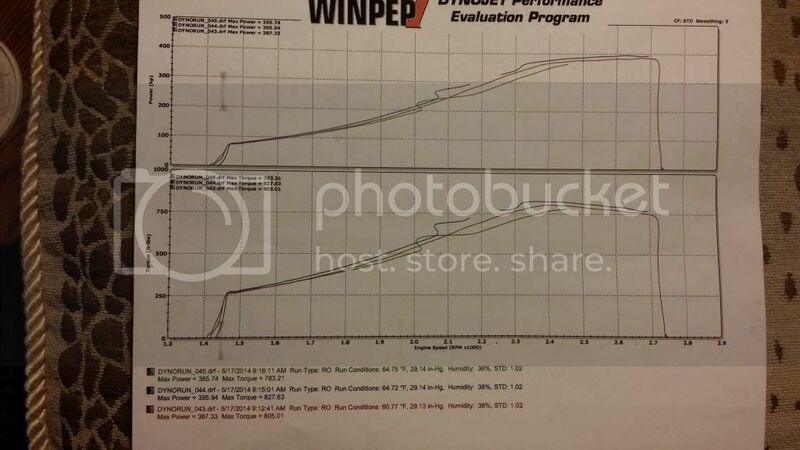 I know 1 guy with a dirtymax said his number was over 50-75hp lower than it was before. Most of the others were just happy to get a number or it was their 1st time. There were 2 CR trucks, one was just shy of 700 and it is usually in the mid 800's without spray and the other I don't know what it did. There were a couple VP trucks, 1 with just a programmer did about 325 or so the other was a little over 400, but I don't know what his mods were. This best on this one is 395 hp and 827 torque.